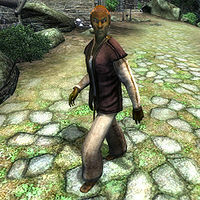 Arvin Dalvilu is a Dunmer farmer residing in Bleaker's Way, a small village in the Great Forest. Arvin appears to be the ne'er-do-well of the Dalvilu clan, as he practically never socializes and his house is more or less empty except for a huge stash of beverages and only a humble bedroll to sleep on. He wakes up every morning at 6am and picks up one of the many bottles from the floor and spends the next two hours breakfasting. The rest of the morning and all afternoon is spent lazily strolling around the house. If you have reached stage 30 of the related quest, he will break off his wandering at 4pm and visit clan leader Nivan Dalvilu at the Bleaker's Way Goodwill Inn for one hour, followed by another hour at home. At 6pm he will take a breath of fresh air outside until he returns to his house at 8pm. The only exception to this routine occurs during the final stages of the Mephala quest, when Arvin will participate in the battle against the Ulfgar clan. If he survives, he will return to his normal schedule. His wardrobe reflects his status and consists of ordinary lower-class items: a brown shirt with light brown linens and pigskin shoes. He wields an iron shortsword and carries his house key and a small amount of gold. This page was last modified on 14 August 2017, at 01:31.